The cold creeps in and brings in its own delight, but leaves me yearning for the warmth and the juicy goodness. Last year I had made Spiced Mango Jam, Watermelon and Mint Jelly and Strawberry Preserve and enjoyed the “canned summer” almost through this summer. Sonal left a comment in the Strawberry Preserves post asking me if she could do a preserve with the peaches she has in her garden. 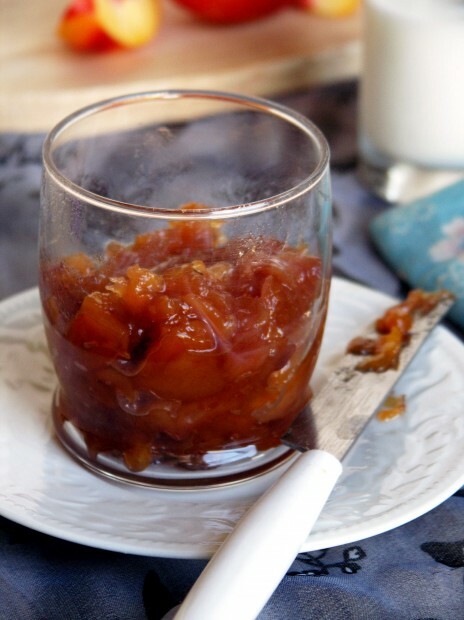 I had not ever made a peach preserve, but I did write to her a recipe along the lines of the other preserves I had made which might work with peaches. She wrote back a couple of days later that she followed the recipe and made the peach preserve. I was tickled. Thank you Sonal. I had loads of nectarines I had bought passionately in the farmers market, when I saw they were locally grown. 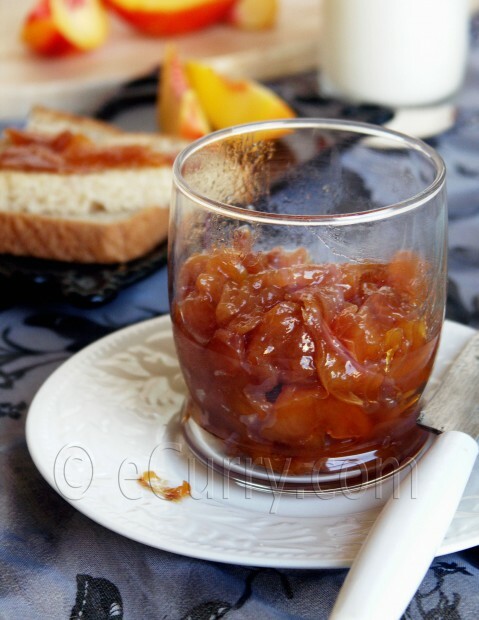 Note that any similar stone fruit will be okay to use with this recipe (peach, apricot etc). I made my nectarine preserve right away and it did work beautifully. With a sharp knife make an X at one end of each nectarine. Bring a big pan full of water to a boil over high heat. Have ready a bowl full of ice water. Add the nectarines to the boiling water and blanch for about 45 seconds; then transfer to the ice water immediately to stop the cooking. When cool, lift out and peel. Slice the nectarines into wedges and remove the pit. Chop in to smaller pieces. In a large large bowl, add sugar and lemon juice and toss. Let stand overnight, until sugar dissolves. In a large sauce pan, bring the nectarine – sugar mix and ginger (if you are using) to a simmer over medium to high heat. Remove if any foams forms on the surface. Simmer until fruit pieces are tender and the mixture gets syrupy, about 30 -45 minutes. You should see the jam like consistency. Do the jam test (explained here). Transfer to a large bowl, cover and let rest overnight. Taste and check if it needs more lemon juice or sugar. If not, can the jam (Canning Procedure). If you feel the need to add more sugar or lemon juice, simmer on the stove top for another 10 minutes at low – medium heat. A perfect topping for our morning toast…looks really yummy! I have never had nectarine before, rather haven’t seen one in the market. I think it will be quite similar to peach. Will try that one. The pics are yummy as usual :). Looks so very good. You left them in chunks? Soma, ask Sonal to send pictures of her peach and fig trees please. I so want to see them. I will write to her to send the pictures. I do not think she is a blogger. Once she sends I will update the post with the pictures. Great idea. Yes I cut each wedge into 4/5 pieces across. I did not process them further to make a mush. It is looking way bigger in the photo than they really are. I love the addition of ginger! Lovely preserves. Looks wonderful! Ginger is certainly a great addition! Ginger has spiced up this preserves and it looks yumm. I am eating so many nectarines right now! It really makes good preserve, ya. 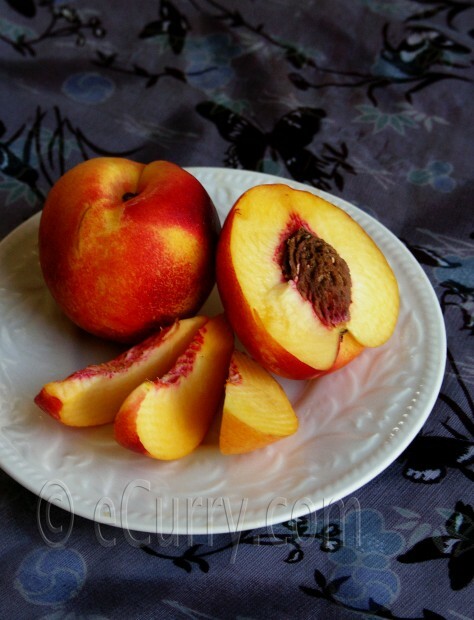 Looks mouthwatering,I have not tried tasting anything with nectarines so far … the recipe sounds really good! This is looks exciting !! a MUST-DO for me ! I just found a plum tree right outside out flat! I should try to preserve them too! Love it. I just took a look at the Watermelon & Mint Jelly recipe you have. I’m going to try this with Kiwi. Our garden is over flowing with mint so I have to find recipes to use it. The recipe says to let mixture stand overnight. Does this mean in the fridge or out on the counter??? Thanks. Cool and leave it out or in the refrigerator.. does not matter. But do store in the refrigerator when finally done.